The artist's son, David Berndt, has spent years tracking down missing pieces of his father's work. Although nearly half of his 500 painting are still unaccounted for, Mr. Berndt, has decided to produce the first published collection of his father's art. He has added an informative and entertaining account of his father's life and career as the proprietor of Wilmington's renown art supply and framing shop - Hardcastle's - and leader of its venerable art community. In his introduction, Charles Allmond defines the book's theme: Bayard Berndt's domain extended to "History, Industry, and Art." David tells this story with over 160 maps, photographs, and colorful paintings. In his foreword, John Schoonover, dean of Wilmington’s storied art community, explains why Bayard Berndt was one of its leaders from the 1950s until his death in 1987. In his introductory comments, Charles Allmond, Wilmington sculptor and friend of the artist, remembers Bayard’s life-long interest in history and art and explains how Wilmington became a center for art. The artist’s son, David Berndt, remembers his father in a charming narrative before discussing his art, which he presents in thirteen thematic collections. Bayard Berndt was taught to paint by Howard Pyle-trained illustrators: Thornton Oakley, Stanley Arthurs, N.C. Wyeth, and Frank Schoonover. His early works reflect his interaction with these illustrators while teaching at the Wilmington Academy of Art. Soon after marrying one of his students in 1935, Bayard and his wife Rita moved ten miles north of Wilmington to Fairville, Pennsylvania where they lived for the rest of their lives. David notices the transition that took place in his father’s art after moving to the rolling hills of Chester County. Over the next 50 years, he painted hundreds of plein aire scenes along Brandywine Creek and in its surrounding countryside. After WWII Bayard became the proprietor of Wilmington’s most popular art supply and framing shop. His freedom to paint was limited by his responsibilities as a businessman. During the following decade he developed two artistic styles fitting with his double career. He became a colorist and brush virtuoso painting rapidly to capture fleeting outdoor light. His works in this genre are reminiscent of Charles Woodbury and George Bellows, and N.C. Wyeth. In his studio, he painted mural-like scenes of historic Wilmington. His works in this genre are reminiscent of Thomas Hart Benton and Grant Wood. The book contains many wonderful examples of both genres. David introduces each collection of his father's paintings with maps that show where they were painted. Many paintings are accompanied by “asides” which highlight the forgotten past of a Brandywine Valley landmark. 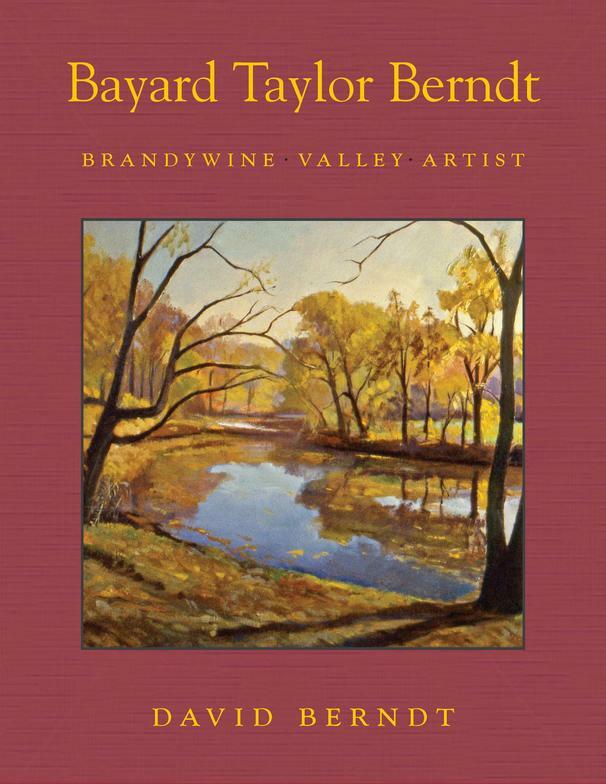 The book is thus an artistic travelogue through the Brandywine Valley. It is perfect for browsing and a delightful memorial to Bayard Berndt’s love of art and history.